and farsightedness; providing a high quality of vision. Laser is the most common treatment for myopia, hypermetropia and astigmatism. However, it is not always the best or only option available, since sometimes it is better to turn to intraocular lens implants. High quality vision for patients with high visual acuity. Sometimes laser surgery is not recommended such as when the cornea is not thick enough, the eye is dry or in case of other ocular deficiencies. It is highly efficient for the treatment of hypermetropia. It is an effective, safe and tested technique. ICL: For patients under the age of 45 (approximately) who do not have hypermetropia. They are placed in front of the eye’s natural lens so the accommodation system of the eyeball is kept intact allowing the patient to see at all distances. Intraocular Multifocal Lenses: For patients with hypermetropia. The lens is removed and replaced with a lens permitting the patient to see well up close and at a distance. Intraocular Monofocal Lenses: In cases in which it is necessary to extract the lens but a multifocal lens is not appropriate. What does treatment with intraocular lenses consist in? A lens is implanted inside the eye to correct the refractive problem. An injector tool containing the lens is introduced through a small 2.75 millimetre incision on the edge of the cornea. Once inside the eye, the lens unfolds and is put into place either in the anterior chamber, the posterior chamber or replacing the eye’s natural lens. Finally, the incision heals without the need for stitches. Local anaesthetic drops are used for the positioning of the lens so the patient is awake but relaxed since a sedative is administered. Once the surgical intervention is completed, the patient can walk out and get back to everyday life after a day’s rest. An astigmatism correcting introcular lens is used in cases where the patient has both myopia and hypermetropia or astigmatism. Finally the day to stop depending on glasses and contact lenses is here. An analysis has been carried out and the best treatment has been chosen for your individual needs. Thanks for trusting in Vistaláser and our doctors. Try to get a good night’s sleep before the operation, do not have breakfast, don’t forget to bring some sunglasses for after surgery and follow our steps for the procedure. You will be awake throughout the operation, the sedative we provide will help you to relax and the anaesthetic drops will ensure that you don’t feel a thing. We use the most advanced techniques; surgery will be over in 15 minutes. Intraocular lens implants are not a last resort for when laser surgery isn’t possible. In many cases ICL or multifocal, intraocular lenses are the most suitable solution for hypermetropia. In many cases, if the myopia or hypermetropia is severe, and laser surgery is possible, the ofthamologist will recommend ICL intracocular lens implants. This is because, in most cases, the intraocular lens provides a better quality of vision than all other options (glasses, contact lenses or laser surgery). The reason for this is that the correction occurs within the eye, allowing objects to be seen in real-size. ICL lens implants are safe and effective for patients with dry eyes and thin corneas regardless of their visual acuity. 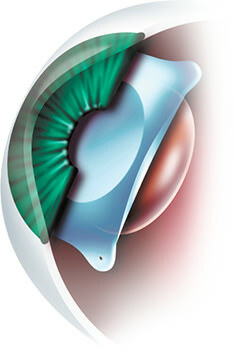 Since surgery is not carried out on the cornea, it does not affect the quality of tears or the thickness of the cornea. Hypermetropia surgery with multifocal, intraocular lenses achieves a stable correction since it stops the gradual loss of visual acuity and ageing of the eye as well as the clouding of the lens. Also, the visual system can focus at all distances without the need to look down or up as with glasses with progressive lenses. More and more patients find this treatment to be the best option as they decide to leave behind their problems with vision and their glasses. This is due to the fact that the lens cannot be seen or felt once implanted in the eye, as well as the high level of experience and safety in this method.